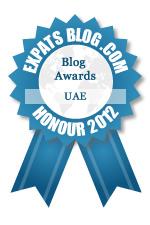 ExpatsBlog.com Expat Blog Awards 2012: United Arab Emirates Honourable Mention Award! This blog won the Honourable Mention Award for best expat blog in United Arab Emirates! Absolutely my most favourite blog in Dubai and a must read. She's funny, creative and a superb blogger. Keeps me and a few of us in Dubai and around entertained. Fab blog. Such an amusing take on life in Dubai. The only blog worth reading in Dubai. She managed to say exactly what everyone is thinking and she always makes me smile. Brilliant. A star! She has a massive following and for good reason. Happy to give my vote. Only Dubai Desperate Housewife can make the most trivial yet topical subjects a joy to read with bundles of wit thrown in. I always look forward to her posts. This is far and away my favourite blog. It makes me guffaw on a regular basis and ihas such fabulous observations. Love it! Love this blog always puts a smile on my face, even since moving back to the UK it reminds me of all the 'Dubainess' I miss so much. Keep it up! Love this blog, very funny and smart!!! Always spot on in terms of Dubai and its quirks. Annabel manages the perfect measure of humour. Love her writing! Very entertaining and never fails to amuse me! A brilliant blog! She feels like a friend who just knows! Sometimes I feel she has a secret camera watching me! It is always so spot on and so well written. Although I have never been to Dubai, she captures the essence of what it is to be an expat! But what I love best about her blog is her honest and witty humour about parenting! Absolutely bloody brilliant! She delivers everytime! Your Name Do you think this blog has what it takes to be listed at the top of Expats in United Arab Emirates Blogs?